As well as being the Assembly Member for Pontypridd, Mick Antoniw is also Counsel General to the Welsh Government. He was appointed to this role in June 2016. 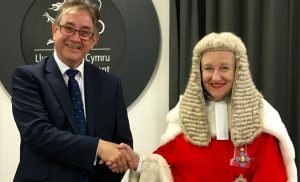 The Counsel General is the chief legal adviser to the Welsh Government and is responsible for overseeing the work of the Welsh Government’s Legal Services Department. More details on the role of the Counsel General can be found on the Welsh Government’s website here. Press releases about the work of Ministers and the Counsel General are published on the Welsh Government website and can be access here. The Counsel General can only provide legal advice to the Welsh Ministers. This means he is unable to provide legal advice or legal support to members of the public in his role as Counsel General. However he can still provide help to his constituents in his role as an Assembly Member. If you live in the Pontypridd constituency please contact him through the contacts section of this website. If you think you do need to contact Mr Antoniw in his role as Counsel General, you can find out how to contact him on the Welsh Government website here.